And it’s not Claire McCaskill (D). 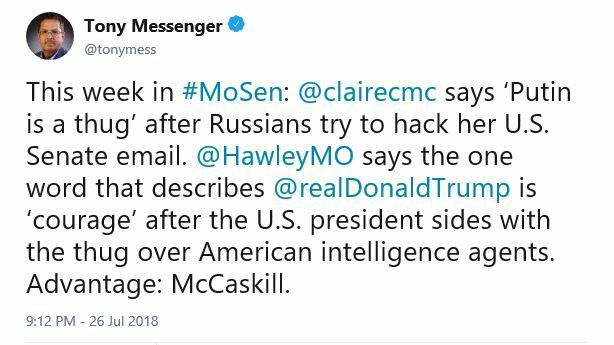 This week in #MoSen: @clairecmc says ‘Putin is a thug’ after Russians try to hack her U.S. Senate email. @HawleyMO says the one word that describes @realDonaldTrump is ‘courage’ after the U.S. president sides with the thug over American intelligence agents. Advantage: McCaskill. Which side are you on, Josh, which side are you on?